Crews clear a big rig from the 5 Freeway after it crashed through the center divider Dec. 17, 2008. COMMERCE, Calif. -- A big rig struck the center divider on a portion of the Santa Ana (5) Freeway in Commerce Wednesday, then flipped onto southbound lanes, leaving several lanes blocked on both sides of the freeway, authorities said. The crash occurred on the northbound Santa Ana (5) Freeway just south of East Washington Boulevard about 5:05 a.m., California Highway Patrol Officer Anthony Martin said. 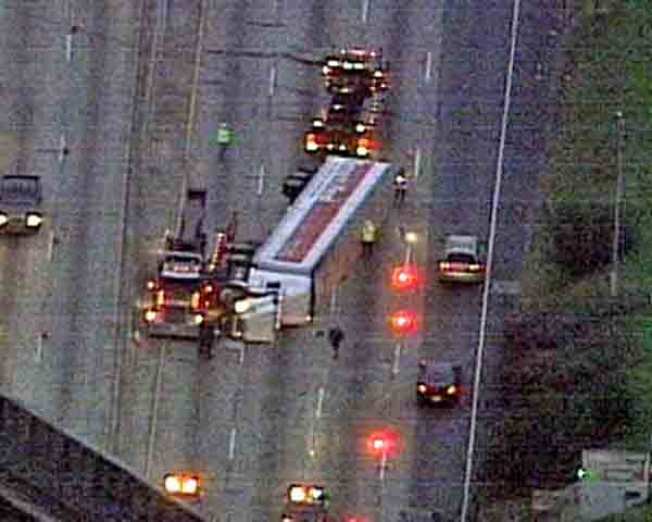 After crashing into the center divider, the semi overturned into southbound lanes, trapping its driver, Martin said. Another vehicle was also involved in the crash, but it was unclear if anyone was hurt, he added. The big rig was turned upright at about 8 a.m. By 10 a.m. The freeway was blocked until the truck's load was unloaded and the wreckage towed away, just before noon. Surface streets in the area are congested.